Even as high-performance Oracle databases power many of today’s most critical business applications, backing them up is no easy task. Because of the sheer size of these workloads, IT teams encounter issues ranging from large backup windows caused by recurring full backups, large recovery times and database cloning times, and an overall lack of wide configuration support. To learn how to ameliorate these issues, read the following resource. 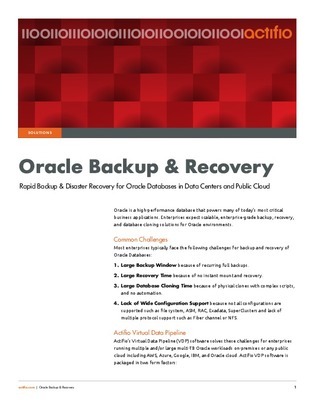 It covers 11 key features and benefits of a virtual data pipeline software that ensures rapid backup and DR for Oracle databases, both in data centers and in the public cloud.